I'm trying a new series which I call Way Back Wednesday. I'm an 80s child, and a lot of pop culture goes along with being an 80s child. I'm going to be spotlighting some different things I remember about my childhood - television, fashion, books, food, and more! I'm starting off with a television show. Confession: I watched too much TV when I was younger. I watch almost no TV now (we don't even have cable) because it wastes my time. However, back when television shows were not trashy, I enjoyed some here and there and everywhere! PUNKY BREWSTER! Oh, Punky, I loved your mismatched clothing and adorable golden retriever and superfun room! Let's see what you remember! Try to refrain from googling the answers! 1. What was Punky's real first name? 2. What was her dog's name? 3. What was Henry's job at the beginning of the series? 4. What was the name of the orphanage that was often in the series? 5. What was Punky's mom's name? 6. Why did she dress like a boy in one episode? 7. What is the name of Henry's Restaurant? 8. Who got married in the final episode? 9. What did Punky want to be when she grew up? 10. How did Cherie almost die? Any other Punky Brewster fans out there?? I was young enough (and not in-charge of the TV enough!) when it was on that I don't remember much about it. But I'll be very surprised if the answer to #10 isn't that she almost suffocated in a fridge while playing hide and seek. 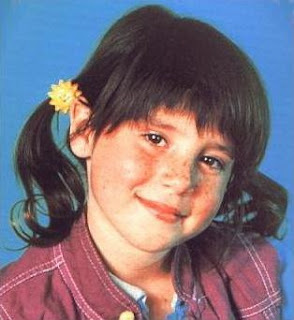 I loved Punky Brewster! But strangely I can't remember any of these trivia questions, except maybe her real first name(or the Punky characters "real" first name? )...if it is the actress...Soleil(I think). This will be a fun series.